The Elliptical Trainer is basically an indoor cross country ski machine that can help you improve your cardiovascular fitness. It’s also great for shaping and toning the muscles in your legs, arms and chest. Not surprisingly it’s one of the most popular pieces of fitness equipment used in the gym or at home. The Elliptical Trainer can help you to get the maximum benefit from your cardiovascular session within the time you have available. It’s a low impact machine which means that there is less stress placed on your joints when exercising. When you’re on the trainer, you’re in control of your session. You don’t have to worry about the weather, pollution, road surfaces, uneven terrain, pedestrians or road users. You can even watch TV while you’re exercising. You can repeat a session and compare your performances. You can train at the exact pace you want to or within specific heart rate zones. The elliptical trainer is a versatile machine and is suitable for people of all ages and abilities. Display console that can typically show elapsed time, calories burned, heart rate, distance, intensity level, revolutions per minute. 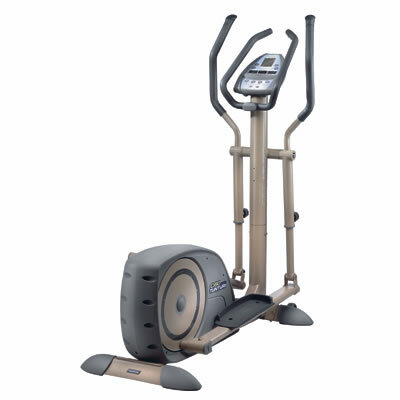 If you’re looking to buy an elliptical trainer then check out my buyers guide. This contains some important information that you should know before you buy.